Blog Why Do Orchids Have Green Roots? Orchids are one of the most popular flowering houseplants in our homes. But have you ever wondered why many orchid roots are green? They certainly don’t look like the roots of most other house plants and in fact, they don’t look much like the roots of most other plants I’ve grown. Why do orchids have green roots? Orchids have green roots because they contain chlorophyll, which allows photosynthesis to take place. Wild orchids are epiphytic, meaning they grow attached to other plants, with their roots exposed to light. They are able to generate energy for the plant in the same way as the leaves. Are Phalaenopsis Orchid Roots Always Green? The short answer to this is no. Healthy phalaenopsis roots can be green, silver, gray or white in color and should be firm to the touch. The color of the roots depends on how frequently and how recently the orchid has been watered and where the roots are situated. Healthy roots that have just been watered should go a lime green color. If the roots are in a potting media that holds onto water, the roots will likely stay a vibrant green color for some time after watering, but after the potting media starts to dry out the roots will become paler as the surface of them dries. Some people who keep orchids actually mount them to wood, rather than growing them in a potting medium. In these circumstances, the roots will only be green for a short period of time and will look white, grey or silvery for most of the time. Some phalaenopsis orchids develop air roots, and these also don’t stay bright green for very long at all. Because these roots don’t have potting media surrounding them holding onto water, they will be bright green immediately after watering but then slowly develop a silvery white surface and become less and less green over time. The color of the roots can be a good guide for when your orchid needs water, but you need to take into consideration the potting media that your orchid is planted in. Regardless of the color of the roots, all phalaenopsis orchid roots should be firm to the touch. Dry and crispy roots indicate dehydration, whereas fragile mushy roots indicate overwatering or root rot. I always pay close attention to the condition of the roots of my phalaenopsis orchid plant as it will often provide the first insight into a problem with the rest of the plant when often the leaves can look perfectly healthy even when a problem is developing. Do Orchids Need Light On Their Roots? Orchids have developed the ability to produce energy from their roots via photosynthesis. This makes perfect sense as in their natural environment the roots are normally exposed to light, so this is really a clever mechanism that orchids have developed to produce energy. However, most orchids that we keep in our homes are kept in pots and the roots are covered with a potting media, restricting the amount of light that the roots can get. Although this may not be ideal, there are certainly plenty of orchids that thrive this way and when they are repotted, the roots will be pale white or yellow, but otherwise healthy. So yes, it is certainly possible to raise a healthy orchid without the roots being exposed to light. But if you want your orchid to thrive and flower as best it can, I’d advise ensuring that the roots get some light exposure. Interestingly, if the roots of your orchid do not get sufficient light, the roots will get paler and paler and can often be almost white or pale yellow in color. This happens particularly frequently when the orchid is planted in an opaque pot, or planted in a potting media that is dense and does not allow much light to penetrate. The orchid roots shown below were from a plant that I recently repotted. Although the foliage of the plant was very healthy and the orchid had bloomed extremely well, the plant was potted in a media that was too dense and moisture retentive. The roots had some evidence of root rot and many of the roots were quite pale in color. When I repotted this plant, I put it in a much looser potting media and ensured that I gave the roots plenty of access to light. Do Orchids Have To Have Clear Pots? Whilst most phalaenopsis orchids are sold in clear pots, it is not essential to keep them in a clear pot. A clear pot is helpful as it allows you to observe the orchid roots easily to keep an eye on their condition, and it also let’s light into the pot so that the roots can photosynthesize to help provide energy for the plant. Having said this, a lot of people put the clear pot into a cache pot, which is an outer decorative pot to improve the appearance of the plant while it is on display. As a result, orchids often don’t get an awful lot of light to the roots anyway, which kind of defeats the purpose of having a clear pot in the first place. I really do think it helps orchids to have some light to the roots as they are so important to the health of the plant. I generally keep my phalaenopsis orchids in decorative pots while the plant is flowering, but once the blooms have fallen off and it enters the vegetative state, I take my orchid out of the decorative pot and place it somewhere bright where the roots can get plenty of light to help the plant thrive until the next flower spike develops. I generally don’t put my orchids on display when they are not blooming, so I don’t mind taking it out of the decorative pot, and the extra light to the roots at this time helps the plant for the next blooming cycle. How Can I Tell If My Orchid Roots Are Healthy? As mentioned above, orchid roots should be firm to the touch and the color should be anywhere from white to silver to bright green. Dehydrated orchid roots will be crispy and shrivelled in appearance. Overwatered roots will be soft and mushy and can be brown or black in color and quite fragile to touch. I usually observe the roots of my orchid every time I water the plant by looking through the sides and bottom of the transparent pot that I grow all my orchids in. I look for the color of the orchids to guide me regarding their health and also to help me know whether the plant actually needs to be watered. If the roots are silvery or white, the plant needs to be watered. If the roots are still bright green in color, the plant has plenty of water and you should not water at this time. Another good thing to watch for is that healthy orchid roots should have bright green tips most of the time. These are the parts of the roots that are actively growing and are a really good indication that the orchid is healthy and doing well. Orchid roots do not grow all the time. When most orchids are blooming, they divert a lot of their energy towards the blooms and do not prioritize growing their roots. If your orchid is flowering and the roots appear otherwise healthy, but have no green tips, do not be alarmed. Continue to provide the orchid with what it needs and once the plant reaches the vegetative stage, the roots will start to grow and develop new green tips. Pests such as snails and caterpillars can feed on root tips. If you see root tips that come to an abrupt stop or if the roots have visible holes in them, it may be a sign of an infestation. You should inspect the plant and potting medium very closely, consider repotting and treating with an appropriate pesticide. Should I Cut The Roots Off My Orchid? If the roots of your orchid are healthy, regardless of whether they are within potting media or air roots, you shouldn’t cut them if possible. The roots are essential to the health of the orchid plant and cutting them will compromise the ability of the orchid to produce new blooms and thrive in the future. However, if you find unhealthy roots that have root rot or are shriveled and crispy, you would be better to remove these to prevent problems from spreading to the rest of the plant, particularly if the issue is a disease. When I repot an orchid, I remove as much of the potting media from the roots as possible and inspect the roots very carefully. If any of the roots are soft and mushy or look like they have a disease or root rot present, I remove these with a sterile pair of pruning shears. I usually sterilize the pruning shears with rubbing alcohol or put it under a frame for a few seconds to kill any bugs. If there is root rot present in the roots, you should ensure that you cut the root with a margin of healthy tissue, to prevent the disease from spreading to the rest of the roots. Regarding air roots, I often get asked is it ok to remove these. Some people don’t really like the look of air roots as they can look a little bit untidy. 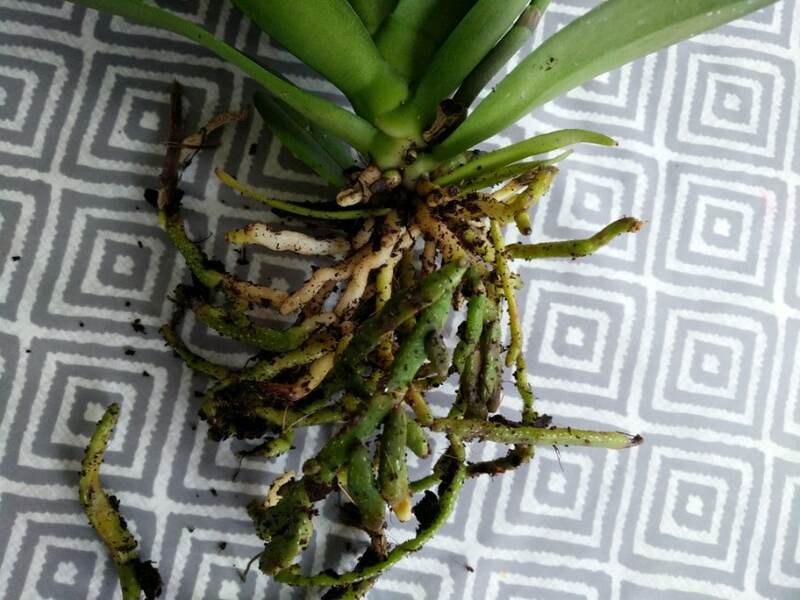 I’ve written another article about whether its ok to trim orchid air roots here. 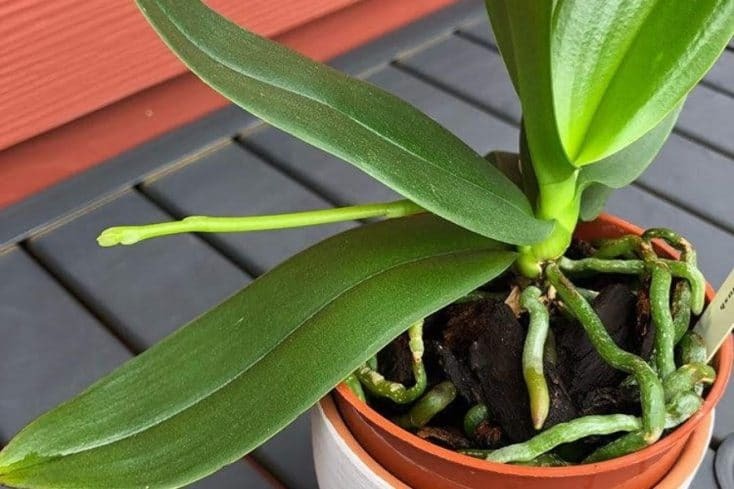 The basic summary is that you shouldn’t cut air roots if at all possible, but if your orchid only has one or two, and the plant is otherwise healthy, it is unlikely to do too much damage removing them.